His Excellency Oleg Serebrian has been the Moldovan Ambassador to Germany since November 2015. Before he represented Moldova as Ambassador to France in Paris, and at the same time he also performed as the Permanent Delegate to UNESCO from 2010 to 2015. He has worked at the Ministry of Foreign Affairs in Moldova and has been member of the Moldovan Parliament. 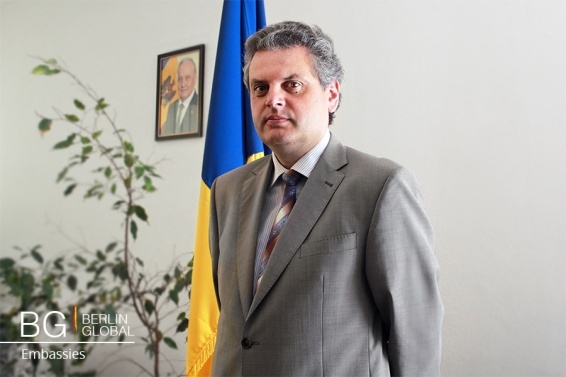 He has also worked as Deputy Rector of the Free University of Moldova. Your Excellency, you have had a very successful career. You have been the Ambassador of Moldova to Germany since 2015. From these different but influential positions, which have you found to be the most challenging? The most challenging? Being the Ambassador in Paris was my first position as an ambassador, so it was very interesting but also being the delegate for UNESCO and Member of Parliament was very challenging. I can say every position was challenging but from a different perspective. You have had also led a very rich, diplomatic career. In which position do you think you gained the most experience or faced some of your most difficult challenges? Probably the position as the ambassador in Paris because France is very important country in EU and also in the World and in NATO. It was a very interesting time for my country, because it was the time of the association agreement between Moldova and the EU. France played a very important role in the discussions with Moldova, Ukraine and Georgia, but especially with Moldova, because it is francophone country. There are very strong ties between France and this roman speaking area of eastern Europe, Moldova and Romania, so it was very interesting period of my life. It was also a gold period of Moldova because Moldova was well perceived at the time, it was regarded as the most successful country of the eastern partnership. There are some changes now, this partnership is now a bit in the shadow because of the Brexit and the Mediterranean issue. Do you think the Brexit will somehow influence Moldova? No, I don’t think the Brexit will directly affect Moldova, but it may impact indirectly of course. The United Kingdom was a very important political partner of Moldova because of some security issues. But it has never been a very important economical partner like Germany, Holland or Italy. These are the most important economic partners in the EU for Moldova. What were your responsibilities as the Delegate to UNESCO? Some meetings in UNESCO were very interesting and challenging, especially meetings concerning the protection of international heritage as I was really interested in that. In UNESCO, I was deputy chairman of the committee for social sciences and political sciences. My university helped me with that a lot, it was kind of a mixture between a diplomatic career and an academic career, so it was very interesting. It was about leading different committees and debates, concerning university books and things like that. It is a different experience, it is good for a diplomat to know not only bilateral dimensions but also multilateral. But it can be a bit of a boring job, at least for me it was! I’m mostly attracted by bilateral diplomacy and not multilateral, and UNESCO is a multilateral field. We had long discussions about different international treaties, of course some of them were very important, protecting monuments or birds and flowers, but I wasn’t deeply involved in these discussions. My deputy was more in the field than myself, because at the same time I was the ambassador to France in Paris. So my main activities were focused on bilateral issues with France, because it was a period of long debates concerning the Moldovan ascension to the EU Association Agreement. You have been the Ambassador of Moldova to Germany here in Berlin for quite a short time. How have you enjoyed the position so far and what has been the main focus of your work since you started? I have been only 7 months in Berlin for now, it is very different from Paris. Germany is much more interested in Central and Eastern Europe than France, and it is much more present. France was more focused on Mediterranean issues and African issues, of course they are interested also in different fields but it wasn’t the key issue for French diplomacy. The position in Berlin is quite challenging, it’s a little bit more difficult than it was in Paris. Also the time has changed, from 2012-2013 Eastern Europe was a priority for EU however now it is over shadowed by Brexit, by migration issues and by terrorist issues. We should work hard, especially in capitals like Berlin or Paris, to remember our existence in all the capitals, to put on the table countries like Moldova or Ukraine as a priority for our German colleagues. How important do you think the role of being the Moldovan Ambassador to Germany is? It is one of the most important ambassadorial positions. For what reasons did you decide to become a diplomat? It was my childhood dream. My aunt was involved in formal Ministry of Foreign Affairs of the Soviet Union as a translator, then she worked in some German speaking countries and maybe somehow I was influenced by that. I continued my studies in France, in the diplomatic branch of the European institute in Nice, I was then accepted to the Moldovan Ministry of Foreign Affairs. First as a desk officer for German speaking areas and then as head of the Romanian section of the Ministry, and gradually I have become a diplomat. How do you evaluate the relations between the two countries? What does Your Excellency consider to be the most important issues of cooperation between Moldova and Germany and in which areas do you think there is space for improvement? Germany is the 4th most important trade partner, second most important from EU countries, and also the second investor in Moldova. We have good relations both in economical and political terms. There were lot of bilateral visits, for example Chancellor Merkel was in Moldova in 2012, and our Prime Ministers have been on several visits to Berlin. Also our Minister of Foreign Affairs will be in Berlin in August and Prime Minister Pavel Filip will probably come at the end of January. Visits take place not only to Berlin but also in Baden-Württemberg. I should say that Germany is perceived as a friend, by many Moldovans. Germany is the most loved western country in Moldova, much more than France despite the fact that French language is close and wide spread in Moldova. About 71% of Moldovans say that Germany is our best western ally, so in the public opinion there is a kind of pro German opinion. Which is influenced perhaps by history, because even before 1944 there was a strong presence of Germany in Moldova. We would like to establish a strong partnership between Moldova and Baden-Württemberg, (the third largest German state). And why? Because there are strong ties between Moldova and Baden-Württemberg, mostly because of the Bessarabia Germans. Besides, some towns have partnerships with Moldovan cities, for example Manheim. In terms of culture, a lot of Moldovan musicians are now in Germany, both unfortunately and fortunately, Dinu Tamazlacaru, a ballet dancer at the Opera House in Berlin and Ilian Garnet, one of the best Moldovan violinists is in Hamburg. In 2017 we are planning to open a museum of Moldovan Germans in Moldova, in cooperation with our German Colleagues. The German language is becoming more and more popular in Moldova, it’s now the 3rd most popular language, 6.3% of Moldovan students are learning German, after French, which is the first foreign language, English is the second. More people learn German than Spanish, which is closer to Romanian. I think the German language is becoming more and more popular because of the very strong economic relations between the two countries, and because of the deep involvement of several German companies in the Moldovan economy. Through speaking the German language, you can find also a job easier. In all the fields we have quite good relations, and I of course hope we will further improve them. There is always room for improvement especially in the economic field. Also cooperation on a local level should improve and the building of special partnerships between some German communities and Moldovan communities. In what ways is the Embassy of Moldova in Berlin promoting Moldovan culture? Does the Embassy organize some events and if yes, could you tell me more about it? Two days ago we organized the Johannisfest in the Moldovan embassy. This event has a different name in different countries but it’s connected to John the Baptist. In September we will organize a concert of a Moldovan pianist in concert house, and another concert together with our Romanian colleagues will be held on the 28th of August on the anniversary of our independence. We have already scheduled an exhibition of some Moldovan painters, inaugurated by our prime minister. The exhibition will be in Manheim, because it is a partner city with our capital, Chisinau. How would you define cultural diplomacy, and what does it mean to you? How can we use cultural diplomacy to strengthen the relations between Moldova and Germany? Cultural diplomacy is very important, I think sometimes for the image of the country it is more important than political or economical diplomacy. Because what do you know about Italy, Spain, or Germany? You know German writers, you know how nice is Sicilia or how nice is Paris. In Moldova people don’t talk about companies but they know the literature or music of the country. So for the image of the country the cultural diplomacy is very important and it is very important to promote this culture, become involved in photographic exhibitions, folk music concerts or dance exhibitions. Because political diplomacy is important for governments, but for 99% of the republic it is is important the culture, sport or gastronomy which is important. That’s why it is important to translate the best authors to another language. So from my perspective cultural diplomacy is a hugely important dimension, sometimes forgotten or sometimes neglected. What is your view on the situation of the Transnistrian conflict? Do you believe that cultural diplomacy could help somehow? With regards to cultural diplomacy as a tool to achieve conflict resolutions and peace. Less in this case, because it is not a cultural conflict, it’s a geopolitical conflict between different parts of Moldova. The majority of population in Transnistria is Moldovan, they are not Russian or Ukrainian, and there are not so many cultural differences. It is more about political and economical diplomacy. Maybe cultural diplomacy could help in a case of Karabakh conflict, or the Chechen conflict. The Transnistrian conflict is a frozen conflict, but there is a good dynamic, it’s a slow one, but there is some dynamic probably it is the only conflict in Eastern Europe where you can see a dynamic. There are permanent contacts between Chisinau and Tirasol, a border is open so you can travel from the Transnistrian side to the Moldovan side. Transnistrian students are studying in Moldovan universities in Chisinau. This is a good thing, there is not a strong border or totally separate bodies like in Abkhazia, Georgia etc. And what is important, there is a diplomatic political dialogue between Chisinau and Tirasol. Can you give us an example of a time during which you were involved in successful cultural dialogue? The most important issues I’ve discussed in UNESCO, was to put some Moldovan heritage on the UNESCO world heritage list. We did a very good job with our Romanian colleagues putting some Christmas traditions on the UNESCO immaterial list. Then the project of Orheiul Vechi, it’s mostly an archeological side but we put it on a list of UNESCO world heritage sites. Your whole career is dedicated to international relations; what advice would you give to young people who are interested in pursuing a career in international relations or diplomacy? To have a nation first of all! There is a general tendency in European countries to forget their own country. Don’t forget about your culture, about your language. It’s very important, this kind of patriotism, even if now everybody is talking about globalization. To have international relations you should have national relations. We are talking about multiculturalism, so you should have a culture. Presenting your national identity is very important.